We have been keeping very busy. On Tuesday, March 4th I had a chance to meet the Delaware Collegiate 4-H group at the University of Delaware. 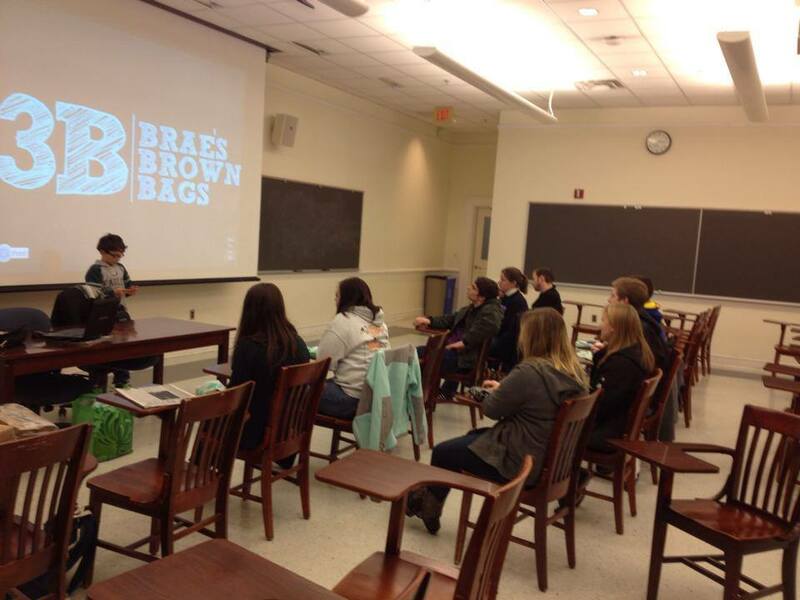 I was able to talk to them for a little bit about Brae’s Brown Bags and how I came up with the idea. I showed them my presentation and they were the first to hear the new song I placed in it. One of my favorite songs, if you want to hear it you will have to have me be a speaker for you. The Vice President of the club is Sara Somers. She invited me to talk and she gave me a very cool tie-dyed t-shirt that says Delaware Collegiate 4-H on it which I thought was very nice. The club helped me pack over 85 bags! I will be delivering them to the Emmanuel Dining Room this coming Sunday. Maybe some will go to a code purple emergency shelter in Newark on Thursday but it hasn’t been called yet so I don’t know. It was fun to present and I like that people want to hear about 3B.